Find out where the Cape Verde islands are and where each island is amongst the others in the Cape Verde archipelago. Where is Cape Verde located ? The Cape Verde islands are located in the Atlantic Ocean (little black arrow on the map), just North of the Equator in a sub-tropical region. 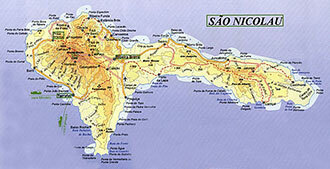 The islands are South of Europe, South of the Canary islands, West of Senegal and East of the Carribean islands. Flight time from Northern Europe is approximately 6 hours. Cabo Verde counts 10 inhabited islands. 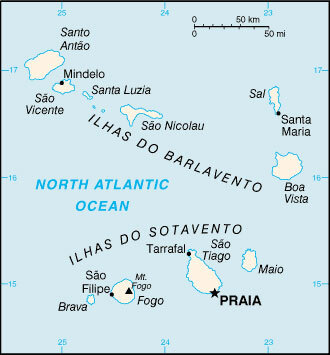 The Northern islands are Boa Vista, Sal, Sao Nicolaum Sao Vicente and Santo Antao. The Southern islands are Maio, Santiago, Fogo and Brava. The official capital is the city of Praia on the island of Santiago. The cultural capital is the city of Mindelo on Sao Vicente. The differences between the islands are remarkable. Some island are flat, sandy and dry (Sal, Boa Vista), other have steep mountains and are green (Santo Antao, Sao Nicolao) and one is volcanic (Fogo). The dialect spoken can differ so much between the islands that those from one island may not fully understand those from another island. 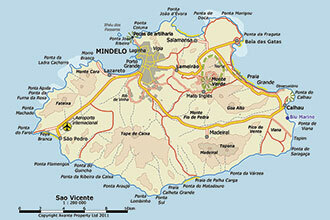 Most o those living in Sao Vicente, live in the city of Mindelo which has a large natural harbor. The airport and largest hotel of the island are situated on the West side of the island by the village of Sao Pedro. Other villages worth mentioning are Salamansa on the North of the island, Bai das Gatas on the North-East and Calhau on the South-East of the island. A village which is virtually abandoned, but located in a picturesque central area of Sao Vicente is Mato Ingles (and old English colonial settlement). There are 3 strings of mountains on Sao Vicente: one on the North-West side of the island, one spanning the South of the island and another spanning the East of the island (including the highest point: Monte Verde). Santo Antao has steep, high mountains which cause the clouds to hug the North-East side of the island and provide the moisture for the abundant green vegetation on this side of the island. This is in stark contrast the West side of the island which is dry with spectacular colors of yellow, browns and reds due to the minerals in the soil. The port of arrival (ferry from Mindelo in Sao Vicente) is Port Novo on the South. The towns giving respite to have something to drink and eat are Ponta del Sol on the North and Ribeira Grande on the North-East. Also worth a visit is the town of Tarafal on the West of the island (caution: takes most of the day to get there because of the bad roads). 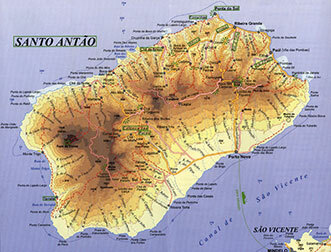 Santo Antao is a spectacular island with amazing countryside, super friendly locals.